This article by Nicole Richards was originally published in Generosity magazine on September 17, 2015. For full text, scroll below. More than 130 people turned out for The Funding Network’s Perth event earlier this month which raised over $56,000 for inspirational projects supporting women and girls. The Funding Network (TFN) held its Perth event earlier this month, generating more than $56,000 for projects supporting women and girls. This figures brings TFN’s cumulative total of funds raised to $2.5 million to date. 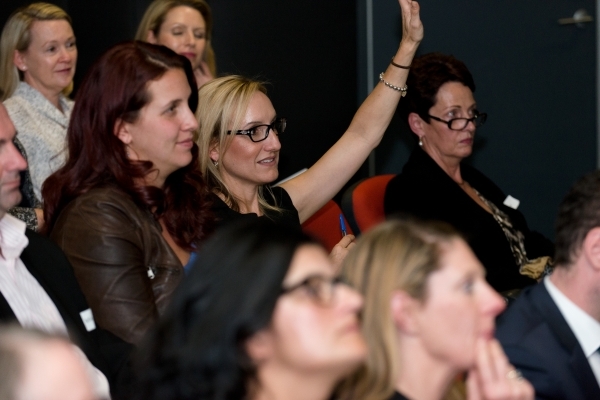 More than 130 guests attended the sold-out WA event – TFN’s 20th live collective giving event – which recognised that an investment in women and girls delivers greater impact for all. The event was presented in partnership with Rio Tinto and Deloitte and began with a mesmerising musical performance by Sam Maher, a Perth drummer who played a rare metallic percussion instrument called a ‘Hang’. The unique and beautiful sound connected the room and set the tone for the spirited stories that lay ahead. Leaders from Foxglove, Zonta House, Girls from Oz and Shine each presented a six-minute pitch to the live audience in hopes of receiving support for their inspirational projects. Kelley Chisholm of Foxglove shared stories explaining the ample benefits of women’s self-help groups in rural southern Rwanda. Zonta House CEO, Steve Parry spoke about education programs for women escaping domestic violence. Nicole Muir, of Girls from Oz, described the positive effects of the performing arts in raising the capacity and confidence of Indigenous girls. When a man sitting amongst the audience yelled abusive comments to a young woman on the stage, it took everyone a moment to realise this drama was the beginning of Shine’s pitch. Shine founder, Amanda Jolley, then came to the stage to speak about their school-based hairdressing salon that provides vocational training and a heightened sense of self-worth to young girls. Melbourne, 29 October: Hosted in collaboration with the Reichstein Foundation – attendees will hear from three exceptional nonprofit organisations working in the field of advocacy to address social justice issues. Sydney, 21 October: Hosted by KPMG – attendees will hear from four outstanding NSW social entrepreneurs. For more information, head to the TFN website.